What Is A Google Analytics Audit? Many websites have analytics installed with incorrect configuration. So key business decisions are based on faulty data. Even worse, most website owners don’t use the full potential of analytics to capture more leads and sales. We’re here to change all that. Our Google Analytics Audit gives you an accurate and comprehensive report that identifies areas of analytics weakness or malfunction. This helps you target more precisely where to gain on traffic and conversions. We start with an assessment of your website’s data collection accuracy. 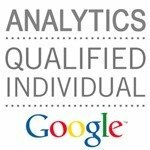 Then we advise on how to properly configure your Google Analytics account to get insight into new opportunities. Our trained, certified Google Analytics experts do this work manually for the most thorough and accurate audit possible – all customized to fit your business’s needs. Confirm your Google Analytics accuracy and unlock its full potential. Give us a call at (443) 475-0787 or contact us here. periscopeUP reviewed the Google Analytics implementation of a nationwide financial services firm in order to investigate a discrepancy in the number of leads measured by their internal system as compared to those reported by Google Analytics. Our Google Analytics audit was comprehensive, checking the tracking code on each page, verifying filter set-up, and examining goal flow and site structure. After identifying and addressing the source of the data distortion, we set-up goal funnels in order to better understand exactly where user drop-off was occurring. With accurate data, the client was able to make better business decisions about the landing pages. periscopeUP worked with the client to streamline the submission form and also to adjust the on-page content to better match visitor queries. Over six months, metrics for a key landing page steadily improved, resulting in a ~1% increase in form conversion rate for organic visitors and a ~9% reduction in organic visitor bounce rate. 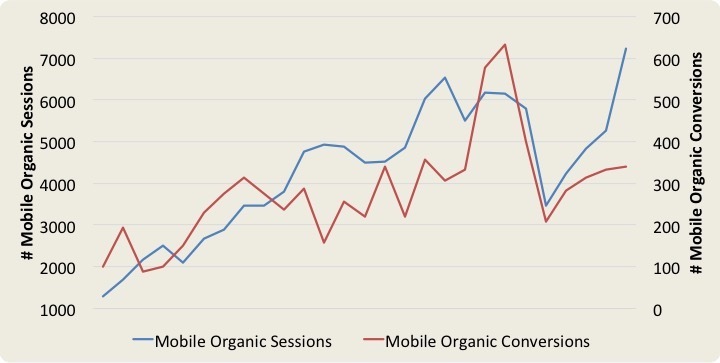 The positive results shown in the graph to the right illustrate the importance of accurate data tracking and collection and how this can influence business decisions to positively impact website performance. Read more about periscopeUP’s efforts on this project here. Call (443) 475-0787 or Contact Us. Is it time for a Google Analytics Audit? You have Google Analytics on your site, but it isn’t tracking from search to sale. You can get much more out of the data. If you uploaded new content, made some quick edits, or added a new shopping cart, Google Analytics must be updated. New Google tracking code releases must be integrated to get the most comprehensive, accurate data. Every time your webmaster makes changes to your website, it can affect data tracking. These issues can break or distort the data collection of your website traffic, ruining your confidence to make good business decisions. How Does A Google Analytics Audit Work? The first step of the process is for us to understand your business. We will send you a form with business questions and have a kickoff call to ask you more detailed information about your tracking and marketing goals. How is your eCommerce revenue being tracked? Is cross domain tracking necessary? Is tracking code added correctly in the right location to all pages? Are profiles and settings setup correctly? Are filters and segments being used properly? 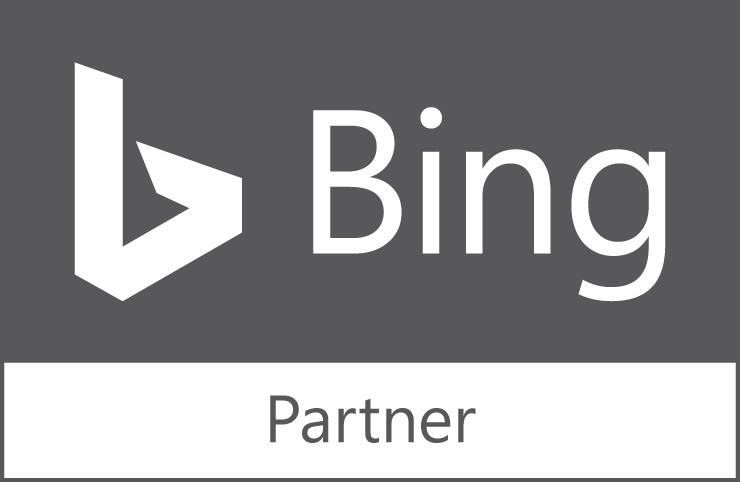 Is your account correctly linked to Adwords? And Webmaster Tools? Is internal traffic coming from your company’s IP addresses being filtered out? What site structure or technical issues are preventing accurate data capture? Are UTM tags being used correctly to track online marketing efforts? With your approval, we make all the necessary changes to your account to ensure you are accurately capturing the data you need in the way you need it. We give you the tools and dashboards you need to make good marketing decisions based on reliable, actionable data. Additionally, we apply our expertise as digital marketers and identify areas of opportunity to get more leads and sales from your website. In this all important step, we set you off on the right foot with an explanation of the data you’re now collecting, how to use it to increase traffic, leads, and sales and how to make basic changes to your Google Analytics profile. Is your Google Analytics properly aligned with your marketing campaign tactics? To find out give us a call at (443) 475-0787 or contact us here.